Nice apartment, clear. Terrace, Parking, Pool, Shops, Beach. Property 65: Nice apartment, clear. Terrace, Parking, Pool, Shops, Beach. Comfortable and modern just steps from the beach in the heart of town. Property 77: Comfortable and modern just steps from the beach in the heart of town. Apartment T3 trés calm center and meadows beach, casino and palace of the congresses. Property 79: Apartment T3 trés calm center and meadows beach, casino and palace of the congresses. 1 bedroom apartment in the beautiful City of Fall, 500 m. downtown. Property 93: 1 bedroom apartment in the beautiful City of Fall, 500 m. downtown. Nous avons pass&eacute; un excellent s&eacute;jour dans cet appartement d&eacute;cor&eacute; avec beaucoup de go&ucirc;t et avec des mat&eacute;riaux de qualit&eacute;. Les nombreux &eacute;quipements sont eux-aussi de grande qualit&eacute; et on se sent tout de suite &agrave; l'aise, comme chez soi (m&ecirc;me mieux !). Tout est tr&egrave;s bien pens&eacute;, rien ne manque et la propret&eacute; est irr&eacute;prochable. De plus, l'appartement est id&eacute;alement situ&eacute; au c&oelig;ur du centre-ville d'Arcachon, sans pour autant en subir les nuisances sonores vitres ferm&eacute;es, ce qui est tr&egrave;s appr&eacute;ciable. Enfin, l'accueil chaleureux et les douceurs pr&eacute;vues &agrave; notre arriv&eacute;e ont fini de nous s&eacute;duire ! Ce fut un r&eacute;el plaisir, nous reviendrons tr&egrave;s certainement. My family of 4 thoroughly enjoyed our stay here in Arcachon. The property was clean, well organized and conveniently located in Arcachon. All the appliances and amenities were in good working order and really enhanced our enjoyment of the place. The dishwasher, clothes washer/dryer, coffee maker, refrigerator all were in good working order and really helped us get the most out our stay. The apartment is stylishly decorated and comfortable. The living room and kitchen open onto the garden patio that is perfect for meals or enjoying some sun. The apartment is about a 2 min walk to a great little bakery, 5 minutes to the beach and boardwalk and about 15 minute walk to the daily market place. The market has a great selection of local foods and goods that is well worth getting to know. 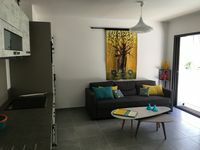 All in all this was very comfortable, modern apartment in the wonderful resort town of Arcachon. Highly recommended!